Fonterra has been ordered to pay Danone $183 million (€105 million) in damages over its precautionary recall of whey protein concentrate in August 2013. The decision has been made by an arbitration tribunal in Singapore. Fonterra says it has assessed the potential impact of the decision and made a "prudent decision" to revise its forecast earnings per share range down from 45 to 55 cents, to 35 to 45 cents, for the 2017/18 financial year . The ruling has no effect on its forecast Farmgate Milk Price. Danone says it welcomes the decision "as a guarantee that the lessons from the crisis will not be forgotten". In a statement it says: "Danone considers that this arbitration underscores the merit of its legal actions against Fonterra, including to champion the highest standards of food safety across the industry. "In April 2014, Fonterra had already been fined by judgement of the Wellington District Court for having breached several provisions of the New Zealand food safety regulations. "Danone believes that food companies and their suppliers can only work together through a solid relationship based on trust, transparency and accountability. Danone will continue to build that relationship with its suppliers across the world." On announcing its trading halt earlier in the day, Fonterra said it expected the decision to be "both lengthy and complex". It also noted neither party had been given advance notice of the tribunal’s findings. 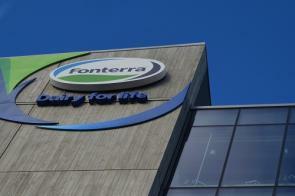 "Fonterra will not be in a position to immediately assess any financial implications and advise the market," it said. Following Danone's statement Fonterra said it was aware Danone had announced it had been awarded $183 million in damages. "Fonterra can confirm that this is the amount of the award and is currently considering the full financial implications of the award. Fonterra expects to provide a market announcement on these implications shortly," the dairy co-operative said. Fonterra subsequently followed up with the statement below. CEO Theo Spierings and chairman John Wilson will host a media conference at 3pm on Friday. The tribunal in the arbitration with Danone on claims arising out of Fonterra’s WPC80 precautionary recall in August 2013 has issued its award. The tribunal has determined that Fonterra must pay a total of NZD $183 million (€105 million) in recall costs suffered by Danone. “Fonterra is in a strong financial position and is able to meet the recall costs,” said Mr Spierings. The Co-operative was reviewing the tribunal’s findings closely, but recognised that there was likely to be limited options for challenging the decision of an international arbitration. Fonterra , I suspect has other concerns . I would suspect that last months arbitration in Singapore will throw another wrench in the balance sheet in the coming months. Buying Danone shares shorting Fonterra may be a good play. You can't buy Fonterra shares unless you are a supplier, but you can buy units. Some farmers would not be too upset if the share price dropped. Especially those who have to share up under the terms of their supply contract-of which I am aware there are a few. Price is still up on a few days ago. Good to have the decision finally announced. Casual , the post was one of two I posted in March 2016 regarding Danone .I have an interest both in Danone and in cows .Following post , purchased Danone shares May 2016, at 59 euros, currently 70.9 euros. Dividend 1.79 Exchange rate Eur/Nzd then 1.55 now 1.74. $183m?!!! Surely they'll appeal? Disproportionate to the crime IMO. Perhaps you underestimate the effect on Danone. I seem to recall the effect on them being quite substantial . Should have not bothered letting them know, would have got away with it. "NZ like a beautiful person with cancer. " We are actually becoming a bit of a joke overseas with our rivers and lakes considered to be little better than water in Pripyap. Never mind - Theo S will jet off to Holland and three months later we will have some more healthy young kids appearing on TV extolling the virtues of FSF. Reminds me of the old Marlboro ads with the virile cowboys telling us how good things were with the cancer sticks. I wonder if John Key is still in denial regarding this? Too busy denying all those lies he came out with about the mass surveillance programme. Double post. Here, have a link. I am puzzled. Fonterra,as a co-op, is supposedly owned by its members,yet the board having made blunder after blunder,remains in place,picking up their grossly inflated salaries. As a long-term stockmarket investor,if they were a fully quoted company,I wouldn't touch them. Well I think this too! Ever since Fonterra was created they've been going on about 'adding value' and creating products out of the milk. But Fonterra is a milk powder producing machine as far as I can tell. And other little bits tacked on. And Theo Sperrings sits there taking his $8+ million each year while farmers struggle. What a bunch of numpties. I agree....sheer apathy by dairy farmers means they get served up the same mediocrity every time...add up the cost of those blunders....remember San Lu...about $250 million down the tubes....another $180 million with this latest loss...along with uncalculated reputational damage....and yet farmers just take it...only an hour after announcement today they get told their divvy will be cut....no mention of a slice coming off the fat cat directors salaries...good old numpty farmer shareholders will wear it courtesy of management and board....again. I agree....sheer apathy by dairy farmers means they get served up the same mediocrity every time. Not sure it's apathy from all farmers. Sharemilker across the road has milked twice a day since calving and hasn't taken a day off since1 June. I think Fonterra rely on the fact a lot of farmers are so busy at the coal face they don't have the time or energy. I recall a report a couple of years ago that showed that our boy Theo travelled overseas on the company coin (back to Cloggy land most of the time) to a level that would have overshadowed our current top travel leader, ex DHB boss Nigel Murray. ...and do you recall the Fonterra director Farelly saying it was a "Win Win for NZ" to export live dairy cattle to China - what a thicko. Strangely now that you try and google that comment it is very hard to find - like its been scrubbed, just like Farelly from Fonterra. Fonterra must have set the record for a NZ producer throwing money into the creek. Im sure it will continue.